Properties in Ronsenac average 4.8 out of 5 stars. Beautiful 16th Century Farmhouse with amazing views and private heated pool! Property 17: Beautiful 16th Century Farmhouse with amazing views and private heated pool! 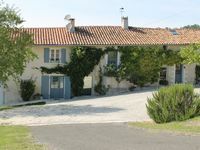 Les Rivieres Martrieux great family friendly estate of 5 gites in 10 acres. Property 21: Les Rivieres Martrieux great family friendly estate of 5 gites in 10 acres. A farmhouse set in its own secure grounds with a private, outdoor pool. Property 26: A farmhouse set in its own secure grounds with a private, outdoor pool. Pretty 2 bed riverside cottage in a Dordogne hamlet. Property 27: Pretty 2 bed riverside cottage in a Dordogne hamlet. Private pool and secluded garden. Family friendly. Property 39: Private pool and secluded garden. Family friendly. Property 43: Family Holiday Hamlet - Heated Pools, Golf, Tennis, Creche, 10 mins to beach! Property 49: Beautifully converted barn In peaceful and stunning location with private pool. We have just returned from a twelve night stay and can honestly say we have never stayed at a better Gite. The standard of accommodation and equipment is first rate and Nathalie provides many extras free of charge. The garden is a huge adventure playground for children which is gated and fenced and there is a separately fenced and gated pool. The Gite is very private with its own outdoor dining and relaxation area but Nathalie is next door and always very happy to assist with any queries. They are a delightful family and we are looking forward to our next visit.